Home Crepe Blog March is Nutrition Month! Did you know that March is Nutrition Month in Canada? March is packed with special days. It is a celebration of leprechauns and Guinness with St. Patrick’s Day on the 17th. International Women’s Day is recognized worldwide on March 8th, and we all welcome the arrival of the first day of Spring every year on the 21st. Each March, Dieticians of Canada bring us Nutrition Month. This year, the campaign is busting up 39 popular food and nutrition myths. Is ‘multi-grain’ the same as ‘whole grain’? Is sea salt less harmful than ordinary salt? Do I have to avoid carbs to lose weight? These truths are essential in making smart choices, especially for our children. Crepe Delicious is a proud supporter of Breakfast for Learning, a national charity whose vision is to ensure that every child in Canada attends school well nourished and ready to learn. Breakfast for Learning is also celebrating National Nutrition Month! The Nutrition Month campaign focuses attention on the importance of making informed food choices and developing sound eating and physical activity habits. There is an abundance of information that is accessible to us online, but what is true? The myths that this campaign tackle are part of what we face each day – ‘Multi-grain’ is not the same as ‘whole grain’, sea salt is no better for you than table salt and no, you don’t have to avoid carbs to lose weight? Visit Dieticians of Canada to read more about these myths. At Crepe Delicious, we believe in healthy eating by selecting fresh, nutritious and wholesome ingredients. All our crepes are prepared fresh-to-order for you. 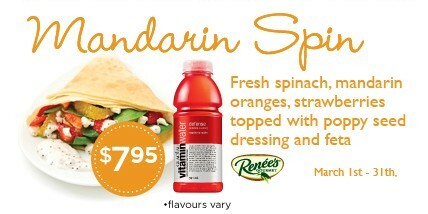 Crepe Delicious is celebrating the month of March with a Mandarin Spin Crepe Combo! Have a healthy and nutritious month!